Lisbeth Salander, the cult figure and title character of the acclaimed Millennium book series created by Stieg Larsson (The Girl With the Dragon Tattoo et al) will return to the screen in The Girl in the Spider's Web, a first-time adaptation of the recent global bestseller written by David Lagercrantz. Fede Alvarez, the director of 2016's breakout thriller Don't Breathe, will helm the project from a screenplay by Steven Knight and Fede Alvarez & Jay Basu. Scott Rudin, Søren Stærmose, Ole Søndberg, Amy Pascal, Elizabeth Cantillon, Eli Bush, and Berna Levin will produce; the executive producers are Anni Faurbye Fernandez, Line Winther Skyum Funch, Johannes Jensen, and David Fincher. The new film will feature an entirely new cast, and this week's announcement marks the kickoff of a global search for an actress to portray in the iconic role of Lisbeth Salander. The production will begin principal photography in September of this year with a release date scheduled for October 5th, 2018. The announcement was made at the London Book Fair during a celebration for the fifth Millennium book launch, also by Lagercrantz. Sony's Columbia Pictures retains the rights to all future Millennium Series books. Sanford Panitch, president of Columbia Pictures, said, "In all of contemporary literature, Lisbeth Salander is completely sui generis – probably one of the greatest female literary characters of all time in my view. Modern punk defiance personified, she is unforgettable in every incarnation, truly one of the most compelling characters we've seen in recent years. 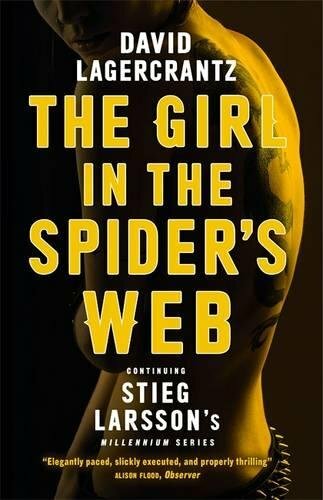 David Lagercrantz's brilliant work in continuing this remarkable series honours Stieg Larsson's masterpiece. We at Sony are so honoured to be part of this series with Yellowbird, and we're so excited to be making an original film of The Girl in the Spider's Web. Fede Alvarez is the perfect choice to direct. Fede is an amazing director with a unique vision of the world. In particular, his talent and skill in creating psychological intensity will bring Lisbeth Salander back into popular movie culture with a roar." Alvarez added, "I'm hugely excited and grateful for this opportunity. Sony has become family to me and I can't think of a more thrilling project to celebrate our relationship. Lisbeth Salander is the kind of character any director dreams of bringing to life. We've got a great script and now comes the most fun part – finding our Lisbeth."